Brooklyn's Broadway has been edited and updated for the third edition of the Theatre Index. "In this section, during the last few years, two distinct groups of buildings devoted entirely to amusement purposes have sprung up. Broadway, where Howard avenue and Monroe street converge, has been the scene of greatest activity. At this point three theatres have been erected and another is now under construction. "The first theatre in this part was built some years ago by the Shuberts, from plans by Harde & Short, architects, 3 West 29th street, Manhattan. This structure occupies a plot in the south side of Monroe street about a 100 feet west of Howard avenue and runs through the block to Madison street. When first opened this theatre staged only the best Manhattan productions, but they were not properly supported. The house is now operated by Marcus Loew, as one of his circuit of vaudeville and moving picture theatres." "At the corner of Broadway and Howard avenue, is the Bushwick theatre , seating 2,500 and operated by the Keith circuit. Adjoining this building is a one-story, modern moving picture theatre , running feature films exclusively. This house seats 450 people. "The newest project in this section is the one herewith illustrated. This building will be a high class moving picture theatre, seating around 500, and will have a Japanese restaurant on the second floor. The building is owned by M. Minden  and is being erected by John Auer & Sons, general contractors, 648 Lexington avenue, Brooklyn, from plans prepared Harde & Short, architects, 3 West 29th street, Manhattan." "Another section, which has seen its development in the last two years, is Halsey street, between Saratoga avenue and Broadway. Almost an entire block is devoted to amusement enterprises of various sorts. 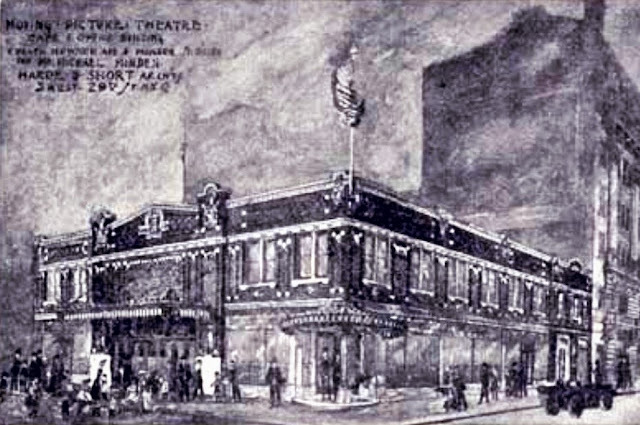 "The Halsey Theatre, seating 2,500, was the first operation started. This was followed by the 'Arcadia' Dance Hall. and later by the Broadway Sporting Club. These buildings were all designed by the same firm of architects."